Yes, in Windows 7 the setting up of permanent launching the programs in administrative mode is not a problem at all, if the user account has administrative rights! 1.) ... The Windows 7 programs always start as an administrator! 2.) 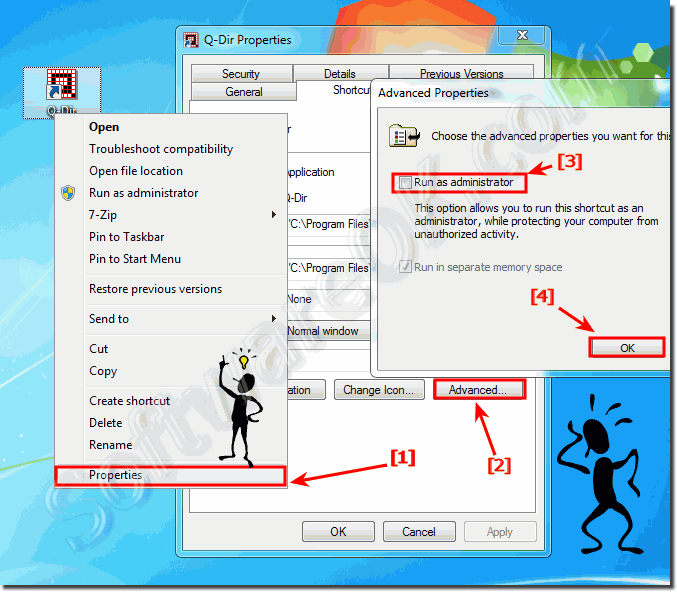 ... Start programs permanently via a desktop shortcut as administrator! 3.) ... What should be considered when starting programs in administrative mode! 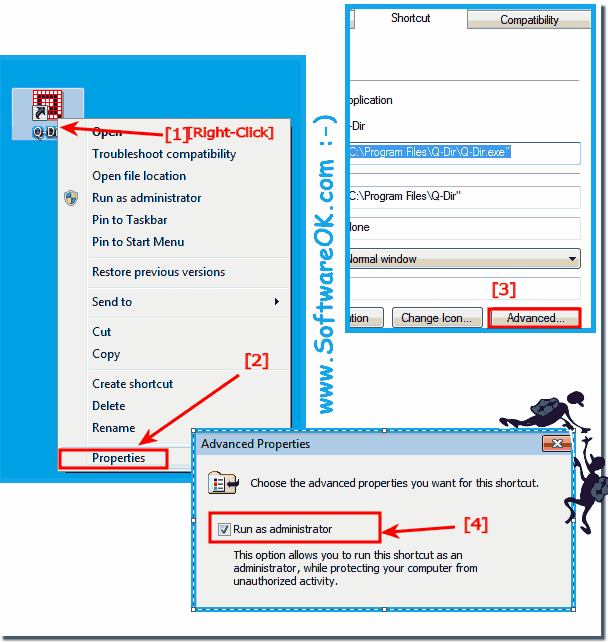 See also: ► Enable the administrator account in Windows 7 with full access, how to? 1.) The Windows 7 programs always start as an administrator! mode! Click with the right mouse button on the program that you want to run always in administrative mode. In Advanced-Properties Window select e.g. check the option Run as administrator and confirm with the OK Button! (Image-1) Always run or start a Programs in Admin-Mode on Windows-7! 2.) Start programs permanently via a desktop shortcut as administrator! In essence, the process is the same. Simply click on "Shortcut" and then on the "Advanced ..." button . In the "Advanced Properties" window, activate the " Run as administrator" check box! You can also label this meaningfully, eg "Program Name Admin Mode"
(Image-2) Windows 7 always run as administrator! 3.) What should be considered when starting programs in administrative mode! The administrative mode should be used with great care, since all programs that are started from this program are also started with full administrative rights, eg if you start one of the file managers, such as Quad-Directory-Explorer . Or start the cmd.exe in the administrator mode. See also: ► ... XP compatibility mode SP1, SP2, SP3 under Windows 10!